Chicago’s large mail order industry didn’t just consist of legendary Sears and Montgomery Ward; many smaller firms also took advantage of Chicago’s transportation hub status and easy access to the hinterlands by locating here. Albaugh-Dover is a prime example. 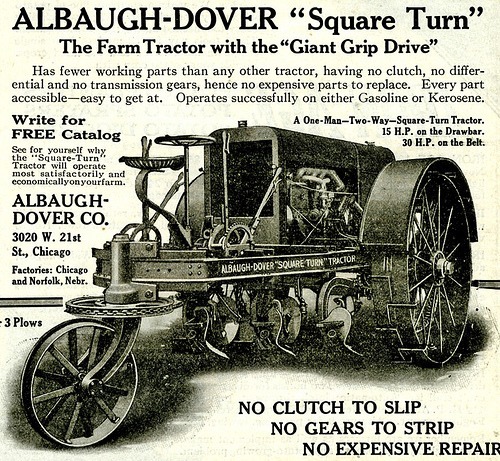 A 1917 ad for an Albaugh-Dover tractor. Farmers were prominent customers of Chicago mail order firms like Albaugh-Dover. While early history on the company is sketchy at best, this is what is known; the firm constructed their factory and warehouse complex on 21st and Marshall Boulevard in 1905, and the main building (at least) was designed by none other than Howard Van Doren Shaw.16 While Shaw is not generally known for his industrial commissions, his major factory design of note is the Lakeside Press complex of RR Donnelley, just north of McCormick Place. By 1950 the factory had vacated the Marshall Boulevard location, according to Sanborn fire insurance maps. Whether they continued in business elsewhere is unknown. However, as shown in the present day photo, the main building survives in excellent condition and is currently used for lofts. This article was last updated on Tuesday, August 25th, 2009 at 11:20 pm.